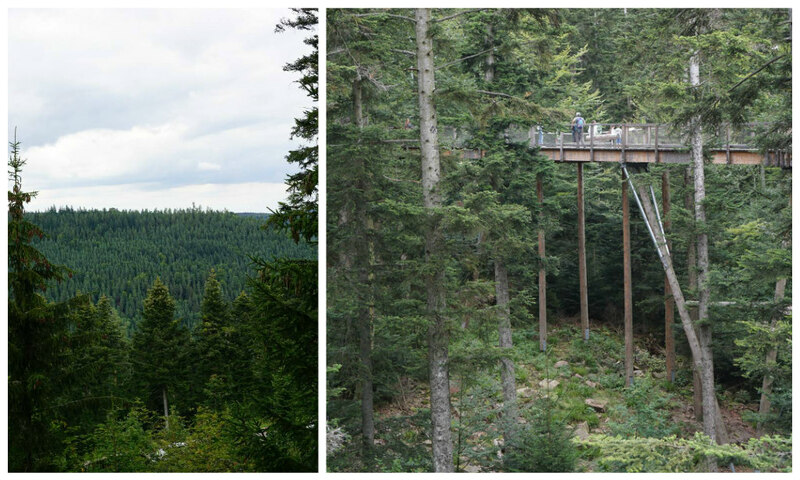 The next stop on our European roadtrip was the Black Forest in south-west Germany. Matt had often talked warmly of a camping trip there from his youth. 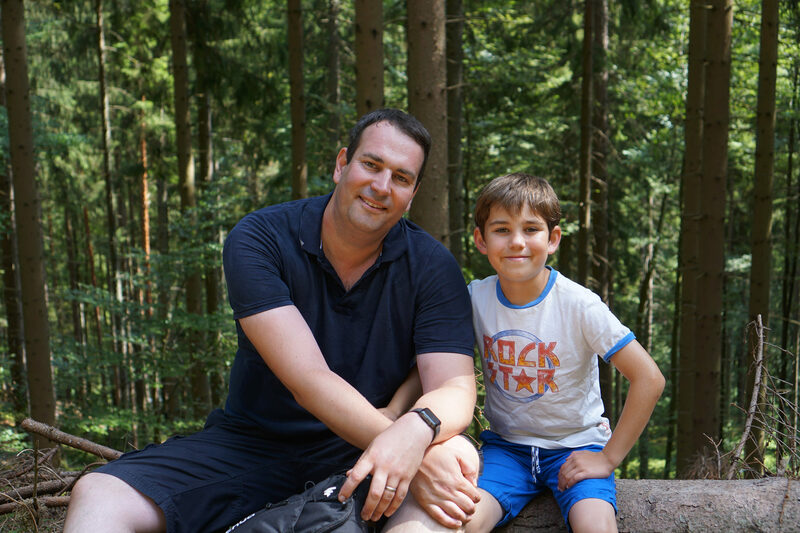 But on consulting his dad to find out more about their trip, he was reminded that actually the most memorable thing about his childhood holiday to the forest was having to get up in the middle of the night to dig a moat around his tent in order to divert the torrential rainwater threatening to wash their camp away! 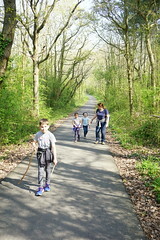 Thank goodness the weather forecast for our visit was significantly better! 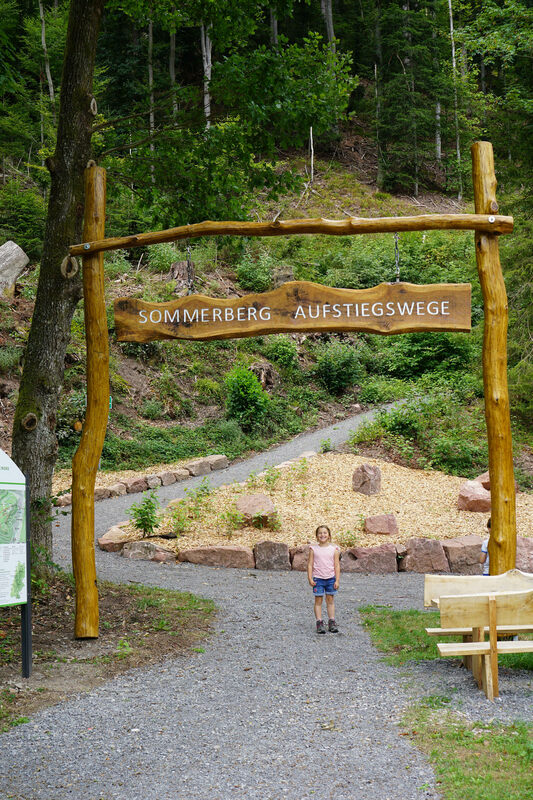 We’d chosen to camp at the Kleinenzhof family resort near the beautiful forest town of Bad Wildbad and loved it from the start. 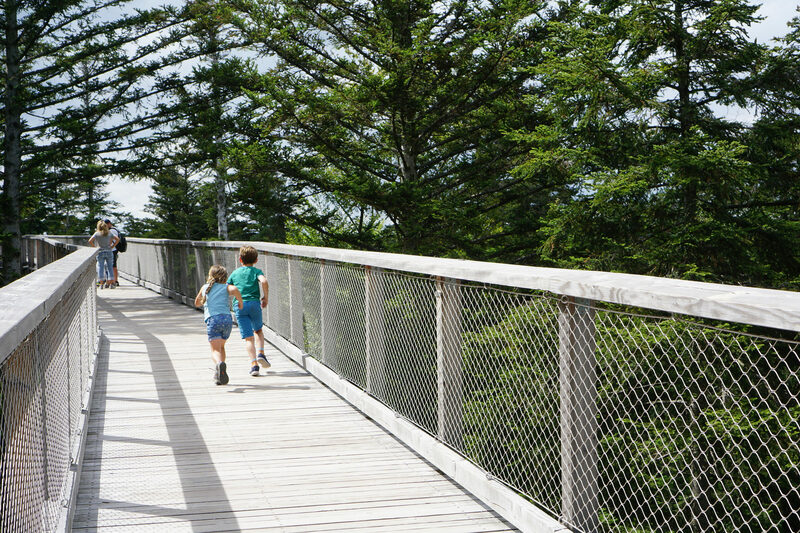 We found ourselves a spacious plot with great views of the surrounding forest. 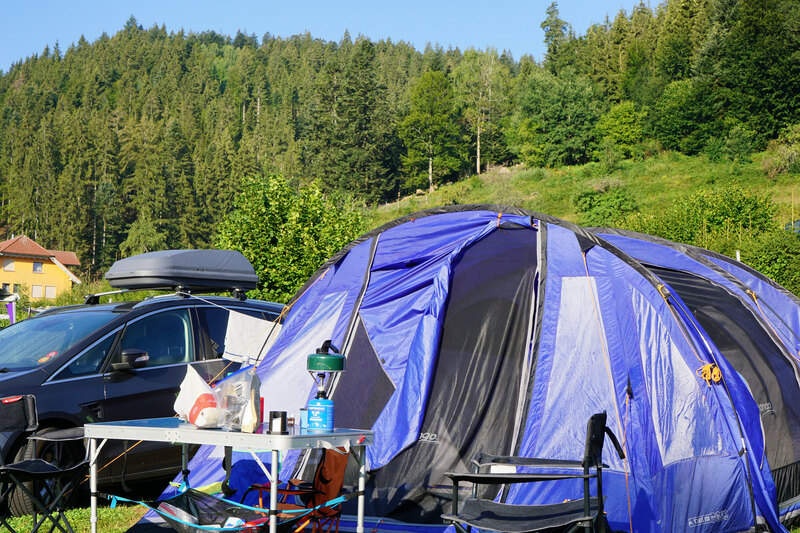 It was much smaller than the first campsite we visited in France, but the facilities were excellent. 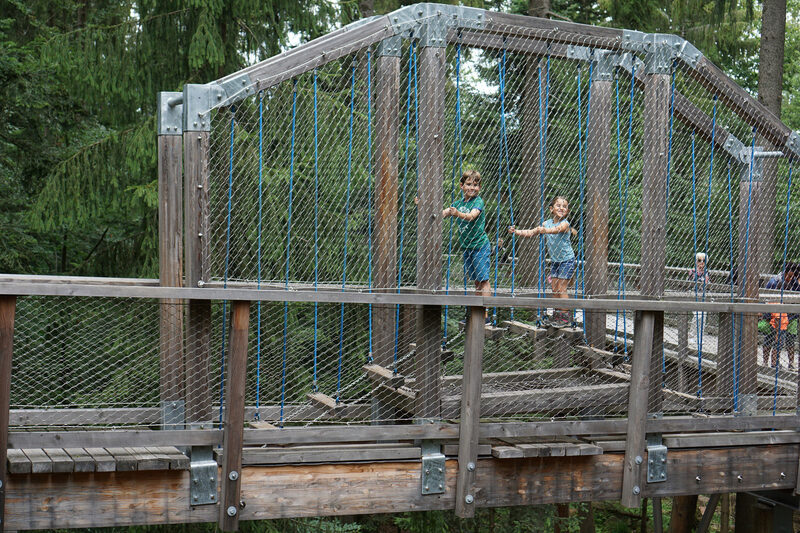 There was a lovely pool complex, several great playgrounds, an onsite shop and bakery, a fabulous restaurant, games room and mini farm – on top of the network of trails that wound away from the site into the forest. And I’ve never seen such impressive shower/toilet facilities in a campsite! The kids were, of course, straight in the pool! 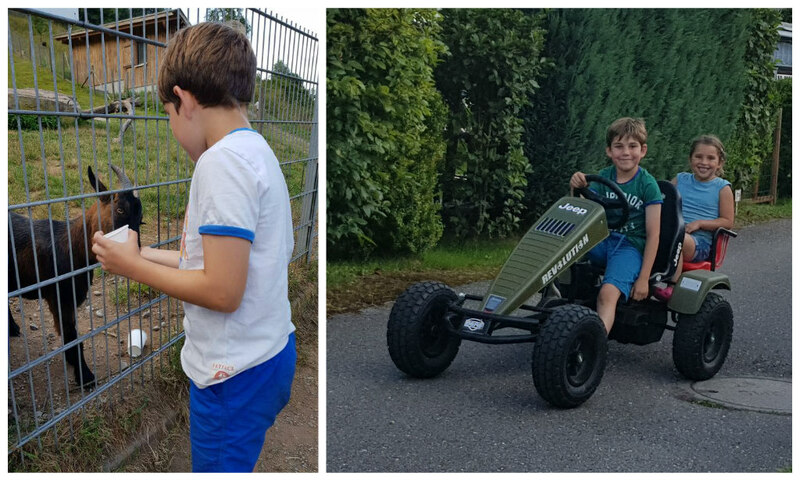 They also loved hiring pedal cars and exploring the site on their own. 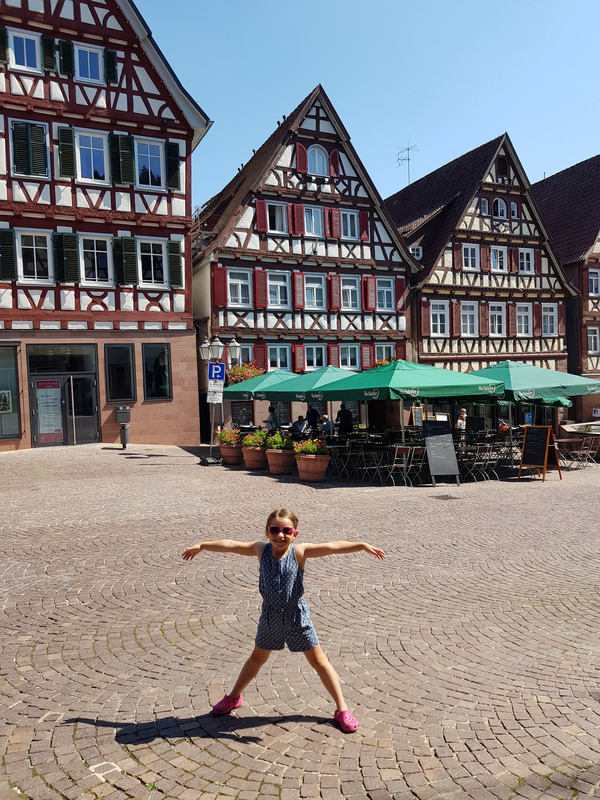 We’d struggled a bit to find out about what to do with kids in this area of the Black Forest before we arrived, but when we were there, we found it easy to fill our days. 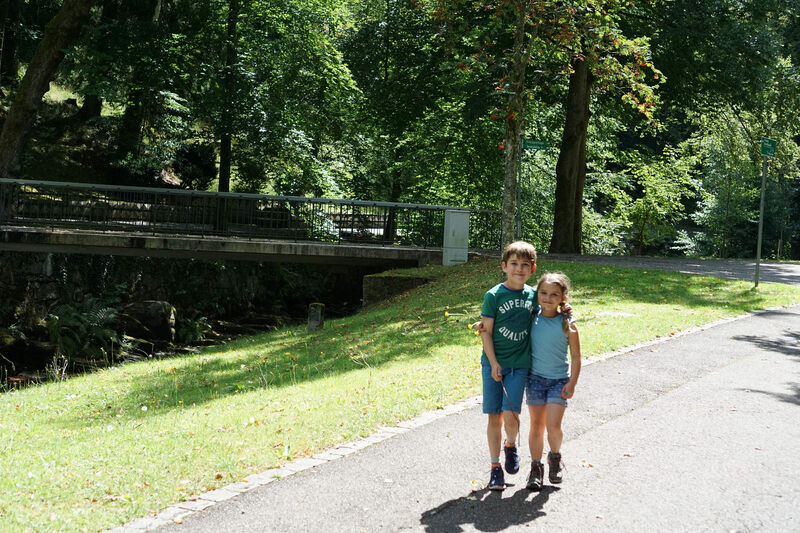 Our nearest town was Bad Wildbad – so we decided to head there on our first full day for a bit of a recce. 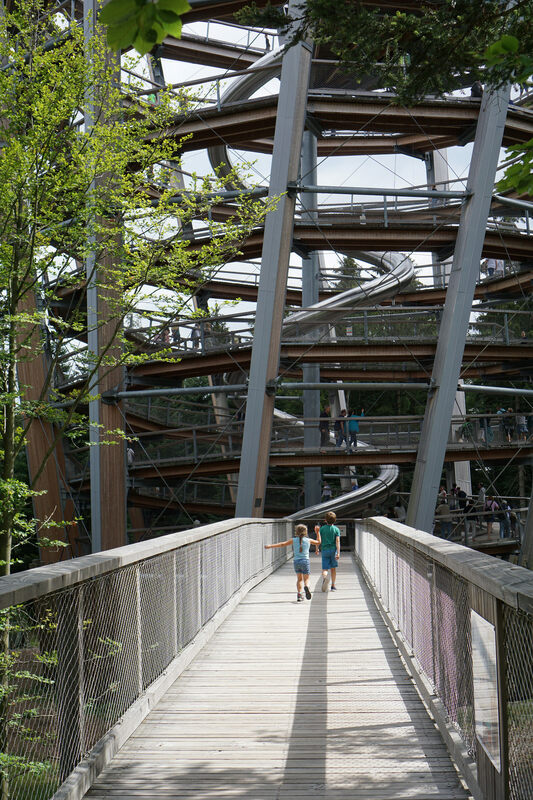 We weren’t sure what to expect – but were immediately impressed. We parked a little bit out of town (because the more central car parks had entrances too low for our roof box!) 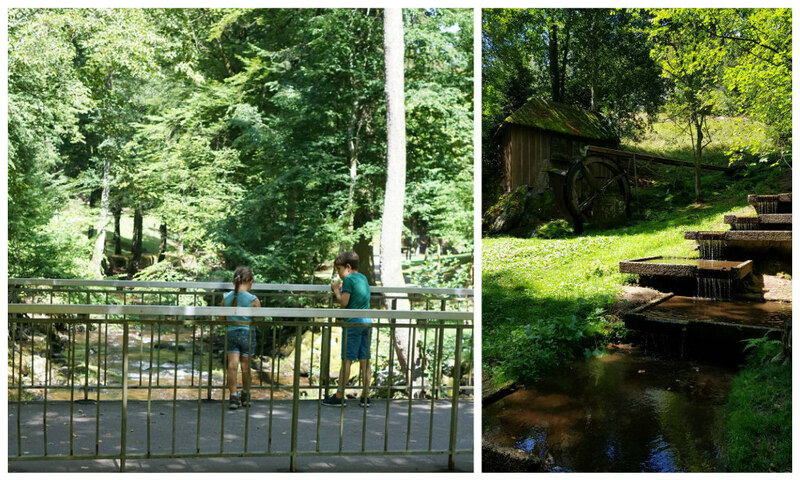 – and found ourselves right next to the beautiful Kur-Park – a gorgeous public park along the river. 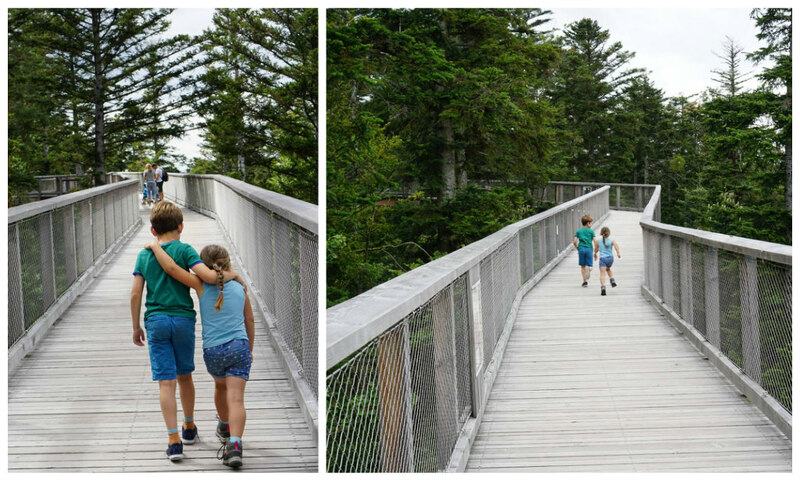 The children headed straight for a brilliant adventure playground and spent ages on the enormous slides while Matt and I figured out the route into town. 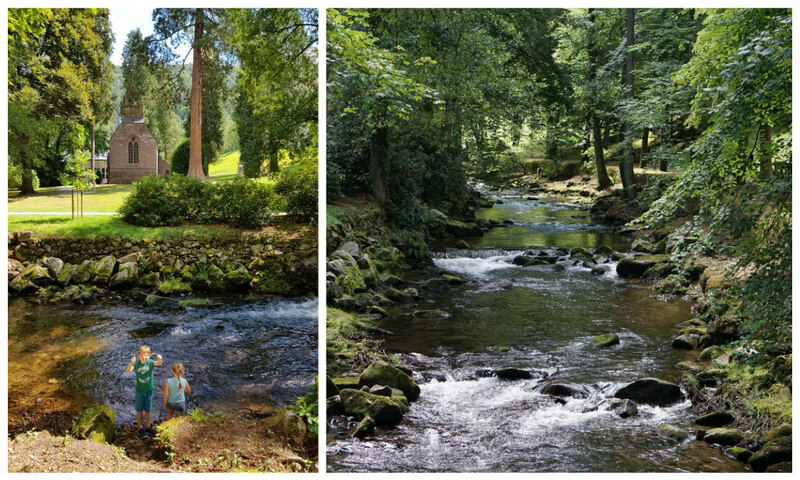 It turned out that we could just follow the river past beautiful mills, water features and churches. 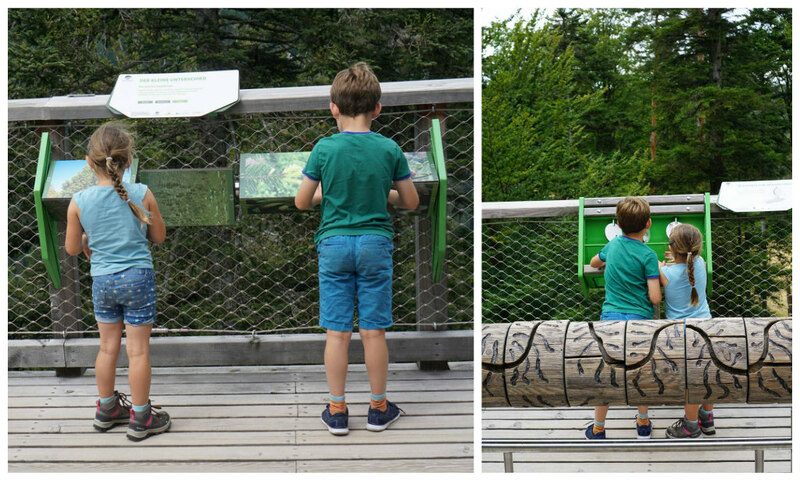 And best of all, activity stations where we could climb, wobble, jump and balance – so much fun! 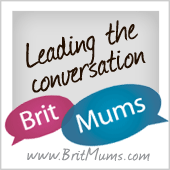 As if that wasn’t enough brilliant fun, the best was yet to come! 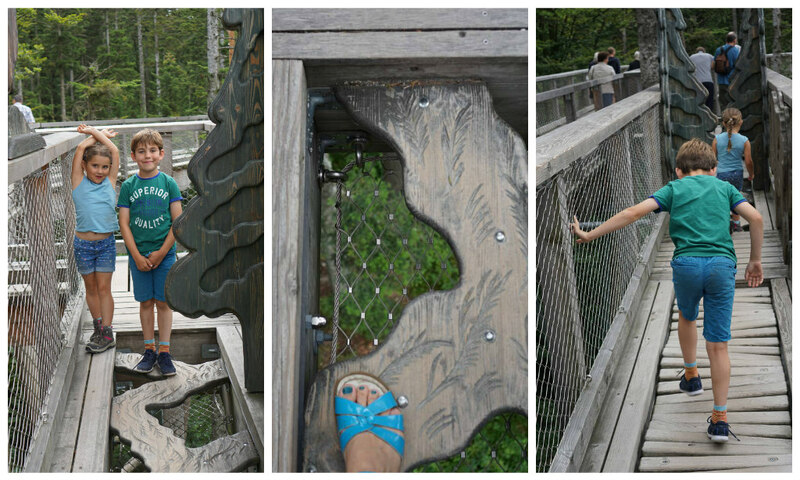 The conclusion of the trail was an incredible viewing tower. 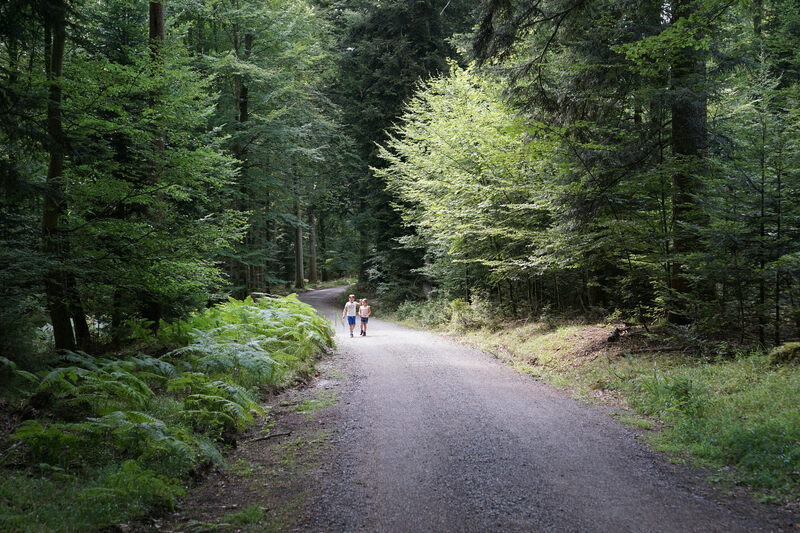 The path gently spiralled up and up, rising above the treeline to offer far reaching views of the Black Forest. 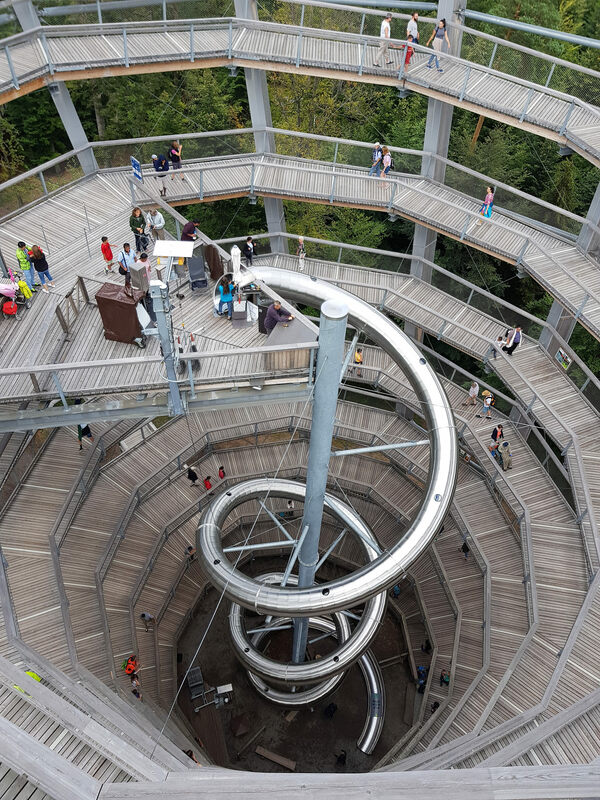 And wrapping around the centre of the tower was a massive helter-skelter! 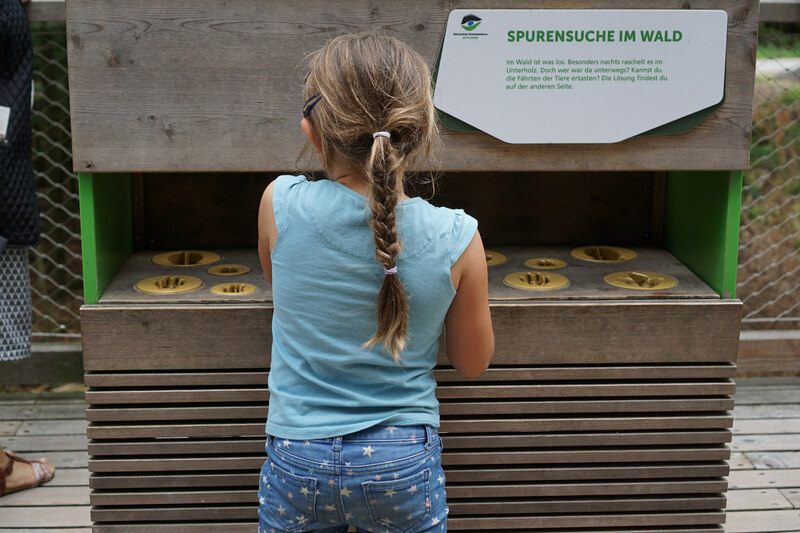 The children couldn’t believe their luck! 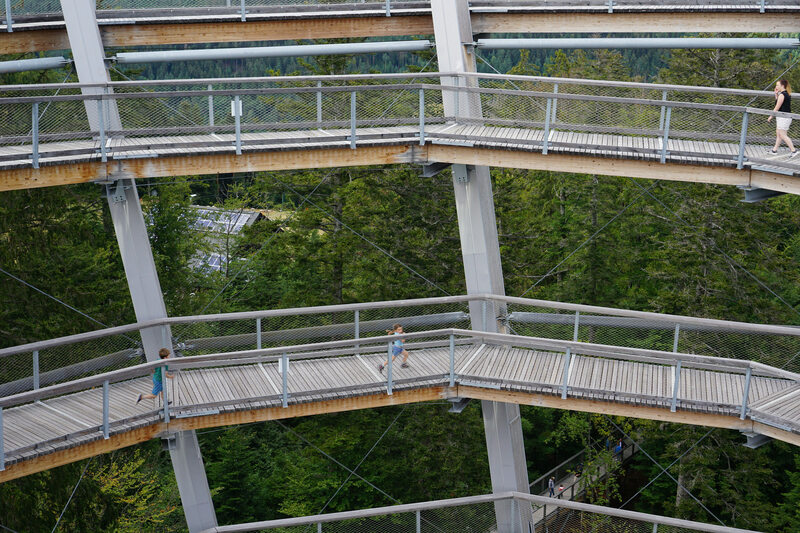 The children ran all the way up – their energy levels always amaze me! 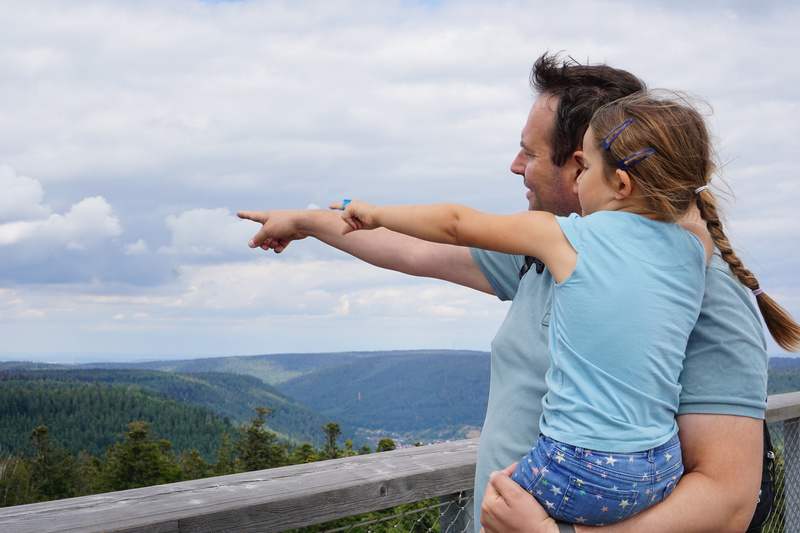 The views from the top stretched for miles and we got a sense of just how huge the Black Forest actually is! 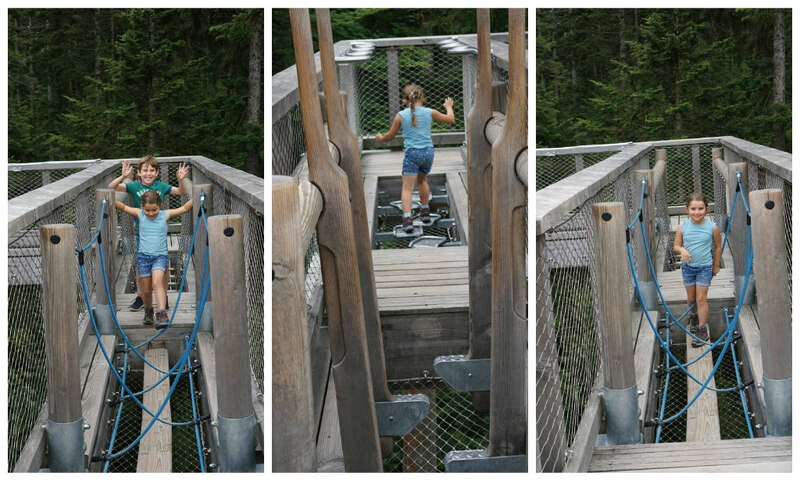 The way down was a lot faster…! 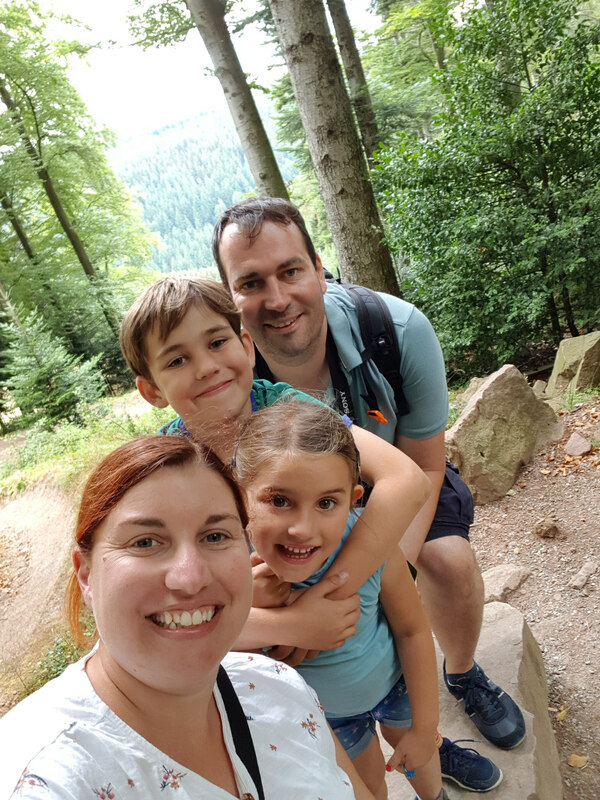 Once we’d dragged ourselves away from the treetop path, we enjoyed a gentle walk back to the funicular through the forest and even paused for a family selfie! 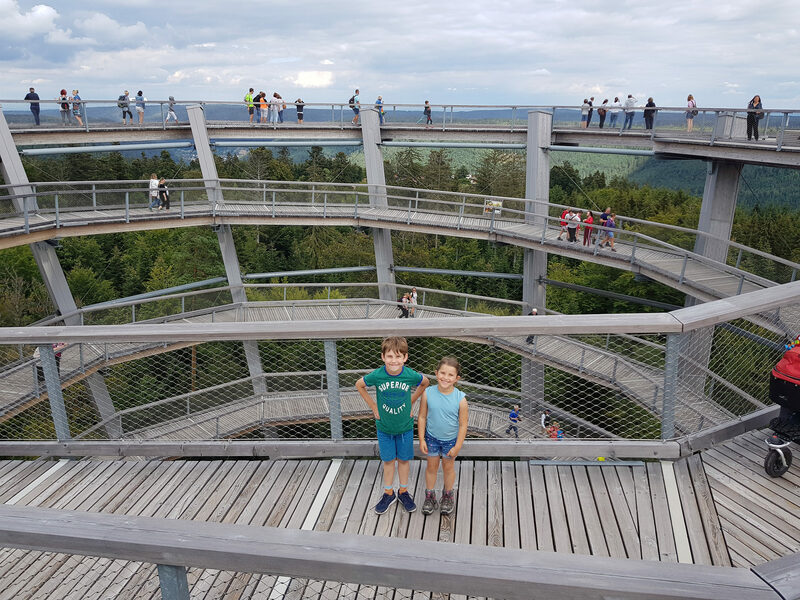 Baumwipfelpfad was truly spectacular and a really special first day in Germany! 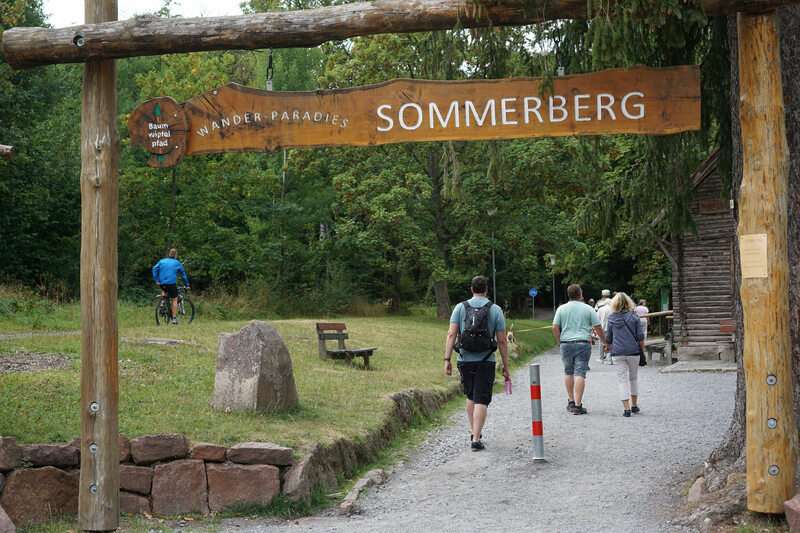 Tempted by the maps of walking trails we’d spotted the day before, we headed back to Bad Wildbad on our second day to explore more of the Sommerberg on foot. 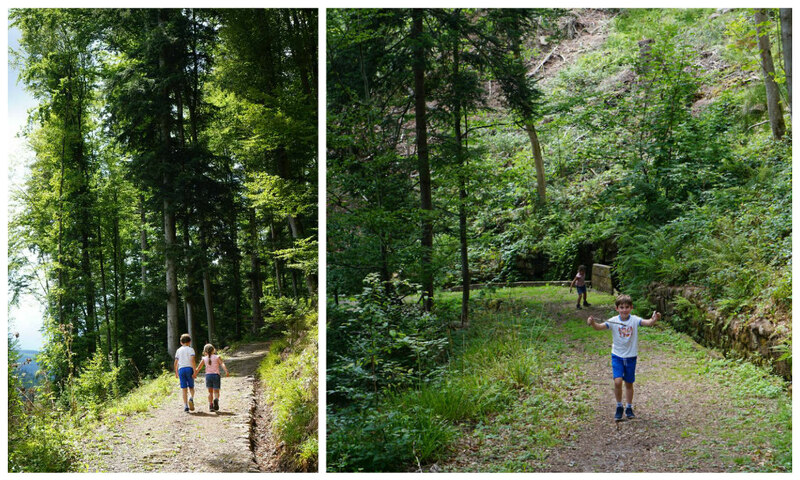 We packed a picnic and set off on the uphill trails from the Marienruhe. 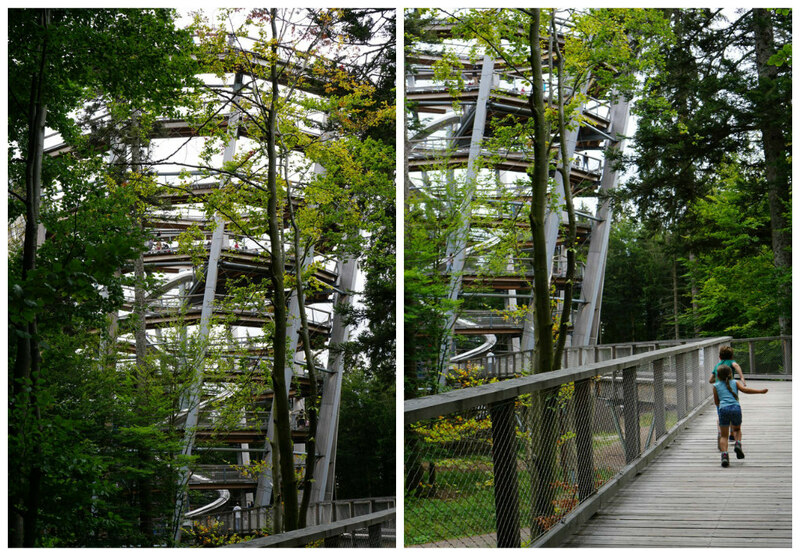 It was a really warm day, so it was nice to be sheltered by the tall forest trees as we climbed higher and higher. 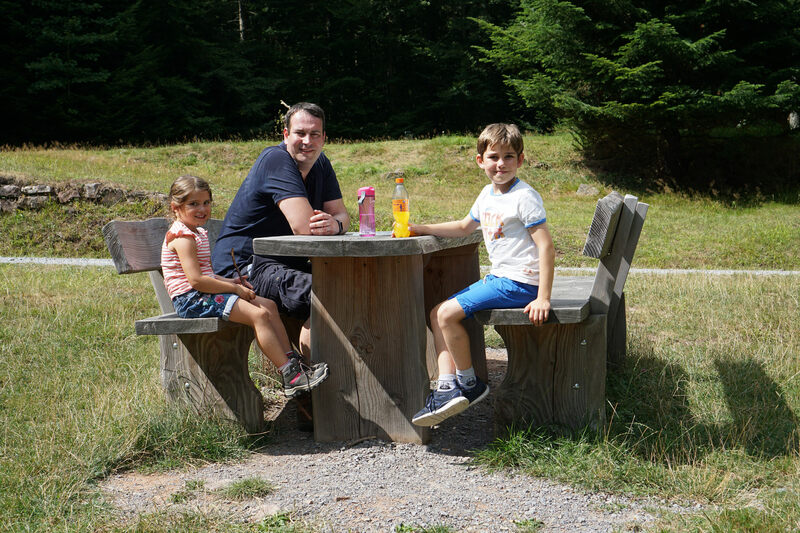 Half way up, we stopped for our picnic – and were all glad of the refreshment. 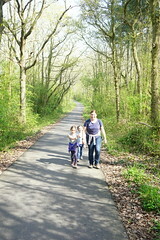 It was hot and tiring walk constantly walking up hill! 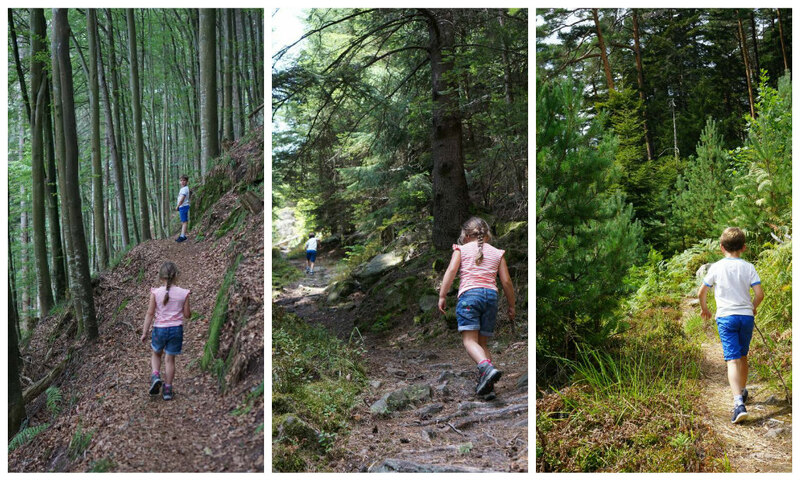 We barely saw another hiker – it was so peaceful! We were relieved to reach a hut and benches at the top of the plateau and paused for another cold drink and a handful of haribo! 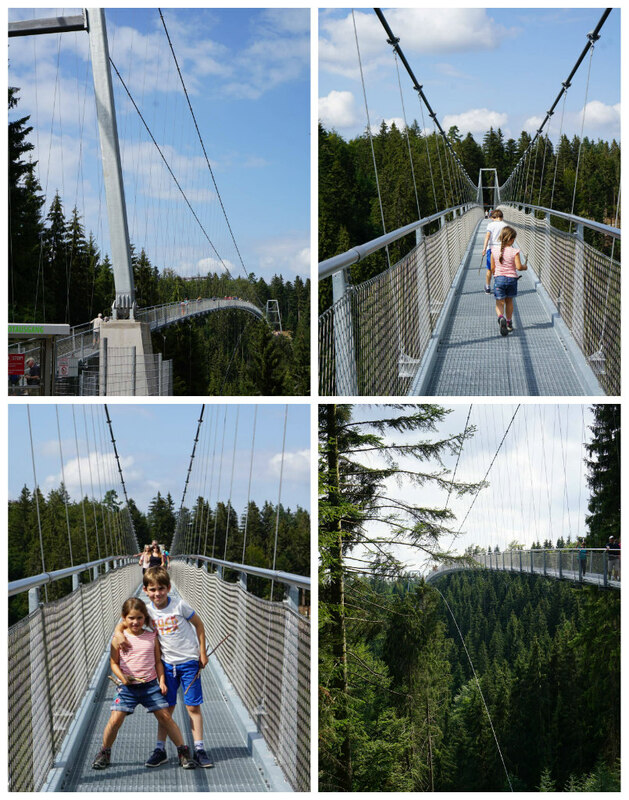 It was much easier walking then along the plateau to the ‘wildline’ – a 380 metre suspension bridge high above the valley. 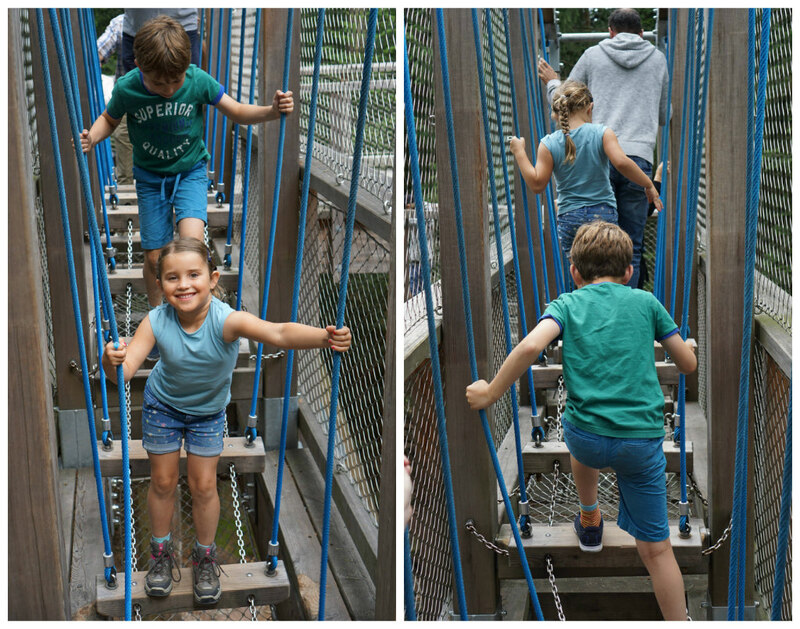 Unsurprisingly, the children loved the wobbly bridge! 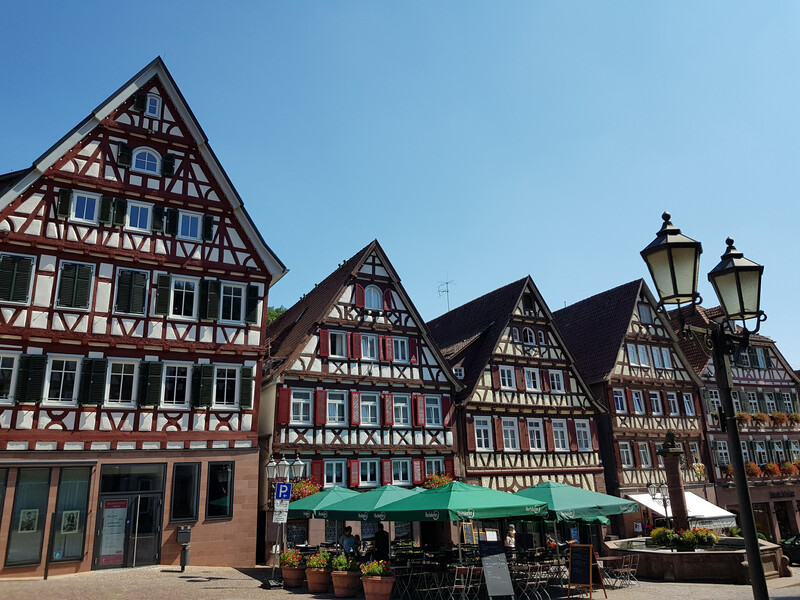 After two days exploring the Sommerberg, we spent most of our final day in the Black Forest exploring beautiful Calw – a town where over 200 buildings date back to the 17th century, with distinctive timber frames. It was meltingly hot, but the children mostly coped with being dragged around looking at architecture well! 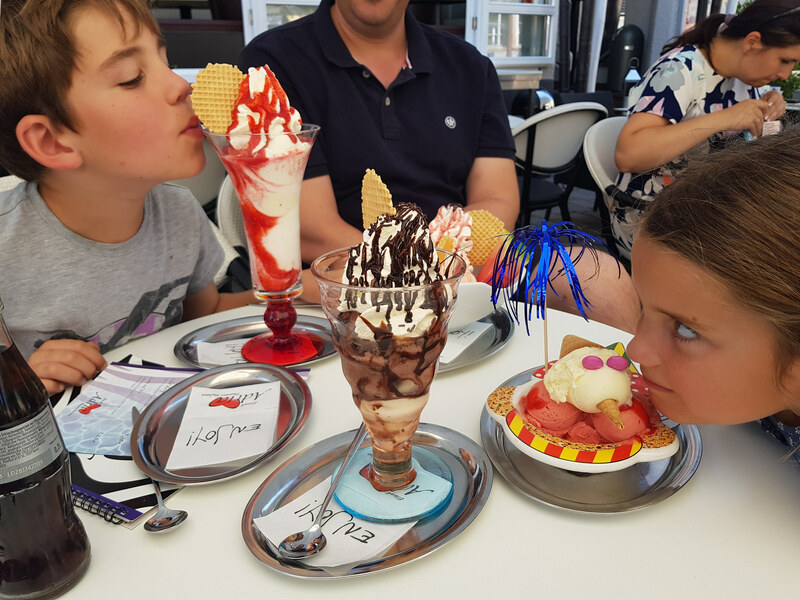 Enormous ice creams helped us cool off! 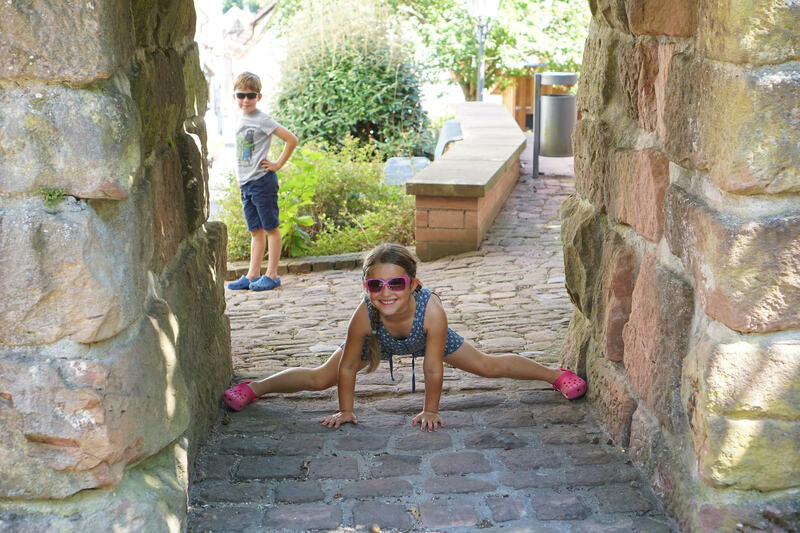 And the children amused themselves with challenges like trying to touch both walls in an alley – they found this hilarious! Once their patience was running out, we found a pretty spot by the river and let them paddle and splash in the river for a while. 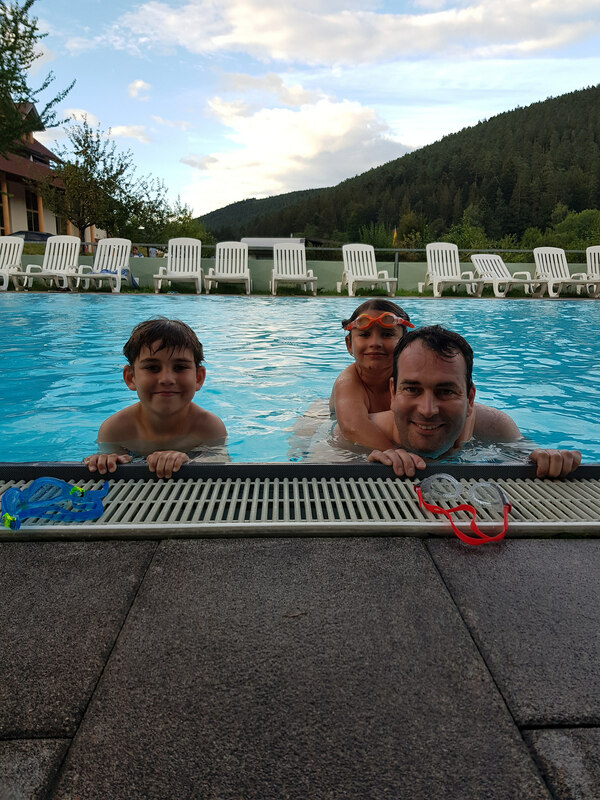 As a spa town, we’d seen plenty of adverts for thermal swimming pools, and we couldn’t leave the area without trying one out. So on our final afternoon, we drove to Vital Therme for a couple of hours. After all the hiking and activity, it was luxurious to relax in wonderfully hot water. The children absolutely loved it, and were made to feel really welcome. 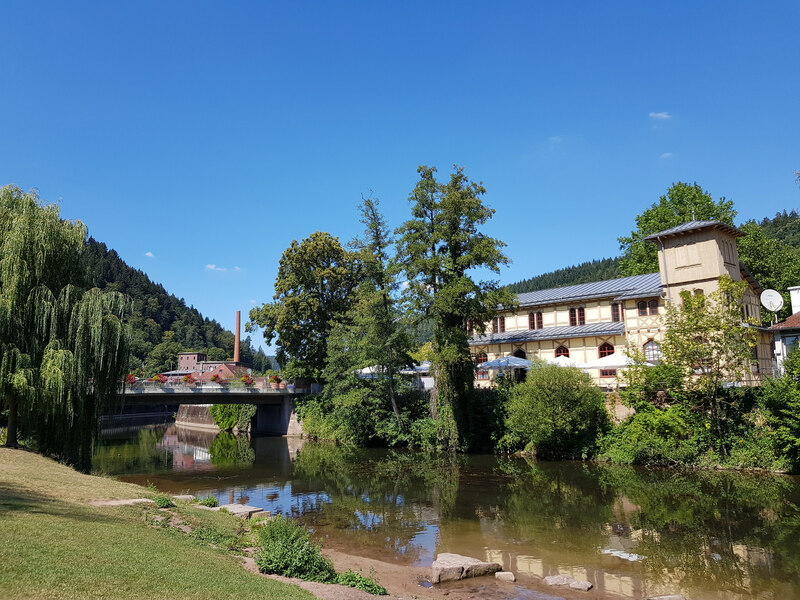 I couldn’t take pictures – but take my word for it, floating in a thermal pool surrounded by trees and mountains was a pretty special end to our Black Forest adventure.